Daily tasks and long term guidance. Business success isn’t an accident, discover growth with CFO Services. Bookkeeping service for small business is more than just debits and credits. CFO Services develop key performance indicators along with timely financial reporting and income tax planning to minimize the share of those hard earned dollars going to the government. With your outsourced CFO, you will experience how our compassionate caring staff becomes your personal business advisors every step of the way. We are the support system behind your successful business allowing you to plan for taking your business to the next level. 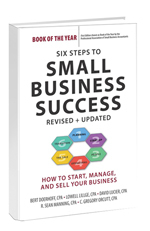 Bert Doerhoff co-authored the book with six steps that will make your business dreams reality.